Bruce Boudreau joined the Anaheim Ducks abruptly last season, accepting their coaching job only days after he was fired by the Washington Capitals. Boudreau arrived well aware of the skill possessed by Ducks standouts Teemu Selanne, Corey Perry, Cam Fowler and Jonas Hiller. Over the course of the season, the coach learned more about what's ahead as prospects including Devante Smith-Pelly (seven goals, 13 points in 49 games) began to establish themselves at the NHL level. Over the course of the 2012-13 season and the years to follow, Anaheim is set to unveil many more young players who will figure prominently in the franchise's future. Kyle Palmieri already has had a couple tours of NHL duty, Peter Holland cracked the lineup briefly last season, and Emerson Etem is knocking on the door of his debut. "There's some quality skill here, and I told the guys that," Boudreau said in the Orange County Register in early July, following an intrasquad scrimmage at development camp. "I've been in Washington for four years and I think there's every bit as good of skill here, if not better skilled players that we had in Washington. And they perennially had one of the best teams in the NHL. "We're on the right track. I see a bright future. I got them T-shirts and it says the future is here. They are the future of our organization. We have to make it continue to be strong like that." 1. Emerson Etem, F: Another top prospect from the United States, the 20-year-old native of Long Beach, Calif., has shown himself to be a pure goal scorer at the junior level the past three seasons. Taken at No. 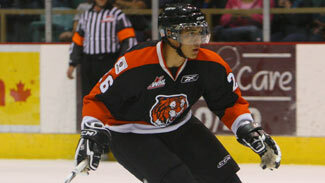 29 in the 2010 NHL Draft, 17 spots after Fowler, Etem played last season with Medicine Hat in the Western Hockey League, where he lit the lamp 61 times in 65 games, finishing with 107 points. He then added a goal in a pair of games for the Ducks' American Hockey League affiliate in Syracuse. The 6-foot, 190-pound wing possesses speed and shooting ability, and has his eyes on making the Anaheim roster out of training camp. "I do feel that it's my time, but whatever the Ducks feel is best for my development, I'm going to do," Etem told the team's website. "Going back to Medicine Hat has paid off huge. When I look at the top six or top nine forwards, the Ducks are deep in that category. I have had an open mindset on playing left or right wing. I'm not too worried about that aspect. I just want to go into training camp, work as hard as I can and show them what I got." 2. Kyle Palmieri, F: After scoring a goal in his NHL debut and seeing 10 games of action early in the 2010-11 season, 5-foot-11, 193-pound Palmieri got a slightly longer look during several call-ups last season and showed flashes of the potential that made him the second of two first-round picks (No. 26) by Anaheim in 2009. The American-born right wing enjoyed his first two-goal game against the Detroit Red Wings on March 14 and had a goal and an assist against the San Jose Sharks five nights later. He was a plus-3 in each contest. Though he's not the biggest guy, everything else about Palmieri -- from his shot to his compete level to his improved skating -- suggests he'll make an impact in the League as a top-six forward. "I want to earn a spot out of camp and be part of that team from the first game," Palmieri, 21, told the team's website about his plans for the upcoming season. 3. Rickard Rakell, F: The Ducks' top pick in 2011, at No. 30 the final selection of the first round, Rakell took a big step forward in his second season in the Ontario Hockey League. He increased his goals from 19 to 28 and his points from 43 to 62 during the regular season, then added 12 points in 13 playoff games for the Plymouth Whalers. "I got better at almost everything," he told the Orange County Register. "My first year, I took a lot of responsibility and just tried to learn and do some other things right. My second year, I felt like I could take another step. Just be a great player offensively and defensively." The 6-foot, 199-pound native of Sweden is known for his creativity with the puck and ability to make flashy plays. He signed an entry-level contract with Anaheim, but at 19 may still need another year of development. 4. Peter Holland, F: Eleven picks before the Ducks grabbed Palmieri, they selected this 6-3, 200-pounder who hails from Toronto. A center who averaged 32 goals and 78 points over the final three of his four seasons with the OHL's Guelph Storm, Holland's scoring prowess translated to the AHL, where he posted 26 goals and 66 points in 74 games with Syracuse. He also had a four-game stint in Anaheim last November, scoring the game-winning goal on Nov. 11 against the Vancouver Canucks. The biggest issue when it comes to how soon the 21-year-old earns a permanent spot with the Ducks and how big an impact he makes is his consistency. 5. William Karlsson, F: The future depth chart at center should also feature this two-way Swedish talent who was taken in the third round (No. 53) in 2011. Karlsson is still filling out physically -- at 19 years old, he stands 6-foot, 163 pounds -- but has shown lots of potential while coming up through the same program, VIK Västerås HK, that produced Detroit Red Wings great Nicklas Lidstrom and current NHL player Patrik Berglund, among others. Karlsson scored 12 goals last season and amassed 45 points in 46 games, but also impressive is the level of defensive awareness he shows for his age. 6. Hampus Lindholm, D: Taken with the sixth pick in this June's draft, the 6-2, 185-pound blueliner earned plaudits while playing for Rogle BK last season, and Anaheim quickly signed him to an entry-level contract and invited him to development camp. Lindholm has a year remaining on his contract in Sweden, but is expected to at least get a look from the Ducks during training camp next month. Speed is the name of Lindholm's game, his skating ability allowing him to keep up with the fleetest of forwards. He posted a plus-15 rating in 10 playoff games to help Rogle win its tournament and earn a promotion to the Swedish Elite League. 7. John Gibson, G: Early returns say the 2011 draft class was a solid one for the Ducks, as in between Rakell and Karlsson they selected 6-3, 212-pound Gibson at No. 39. Goaltending prospects are always watched closely, and with Anaheim starter Jonas Hiller and new backup Viktor Fasth each 30 years old, Gibson projects as the franchise's future between the pipes. A product of the U.S. National Team Development Program, the 19-year-old had to persevere through injury and illness playing his first season in the OHL for the Kitchener Rangers. His final stats were strong: 21 wins in 32 games with a 2.75 goals-against average and .928 save percentage. Size, mobility and a calm demeanor are among Gibson's best assets. 8. Sami Vatanen, D: A fourth-round pick in 2009 who has stayed in Finland the past three seasons, it appears the 5-9, 165-pound defenseman's arrival in North America is on the horizon. Vatanen probably needs a bit of AHL seasoning in order to hone his game, but his time in Anaheim could come sooner rather than later depending on his development and the team's needs. Vatanen has been lauded for his two-way play, and the 11 goals and 34 points he's averaged per season during his time with Jyvaskyla of the SM-liiga suggest his shot could be a potent weapon on the power play. 9. Max Friberg, F: Anyone paying attention at the 2012 World Junior Championship couldn't help but notice the 5-10, 194-pound left wing, who made up for his lack of size by lighting up the score sheet in a big way. Friberg, almost an afterthought as a fifth-round pick in 2011, was anything but when he led Sweden to gold with a tournament-high nine goals. He also had a goal celebration for the ages in a shootout win over Switzerland. The 19-year-old's numbers during the season for SEL club Timra IK (five goals and 10 points in 48 games) belied his offensive talents, and his high energy level could make him a fan favorite if his career pans out. He impressed at the Ducks' summer development camp. 10. Patrick Maroon, F: The third-leading scorer in the AHL last season (32 goals and 74 points in 75 games) with Syracuse, time is running out on the 24-year-old left wing to make good on his prospect label. The 6-4, 225-pound player once put up consecutive 90-point seasons, one in the North American Hockey League and the second for the OHL's London Knights, but after the Philadelphia Flyers made him a sixth-round pick in 2007 he underwhelmed for the minor-league Phantoms before getting dealt to Anaheim. 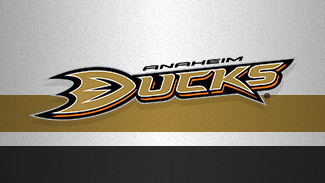 Maroon made his NHL debut last season and was scoreless in two games for the Ducks.